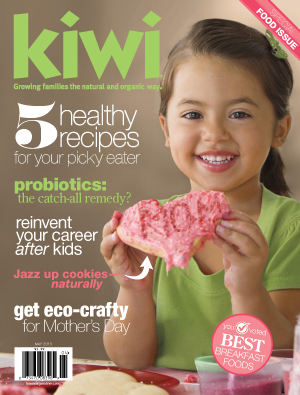 Check out the April/May issue of KIWI, a fantastic up-and-coming magazine that helps families cook, play, eat, grow, and live organically. The current issue offers recipes to please picky eaters, advice on reinventing your career after kids, and my article about bringing that spring garden to life. Many thanks to my expert sources: Fern Marshall Bradley, author of Rodale’s Vegetable Garden Problem Solver; Barbara Pleasant, author of Starter Vegetable Gardens: 24 No-Fail Plans for Small Organic Gardens; and Sarah Pounders, education specialist with the National Gardening Association.